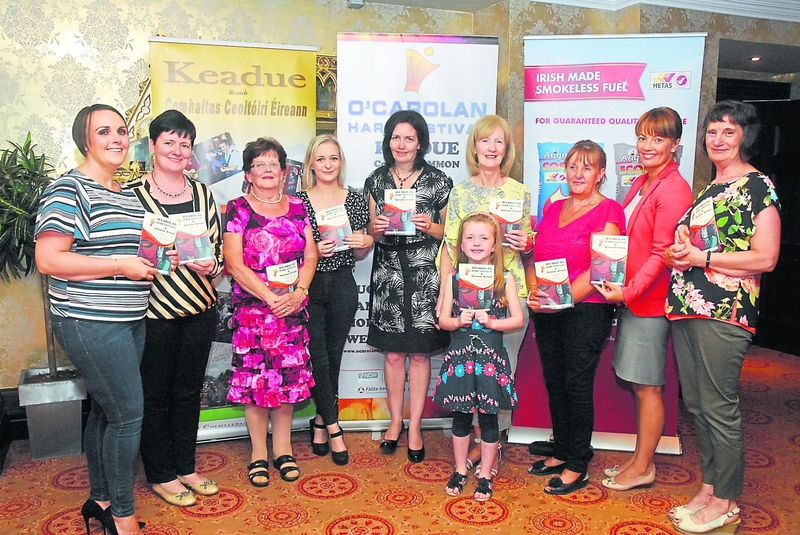 O'Carolan Harp Festival Committee members pitured at the launch of this year's event in Kilronan Castle. 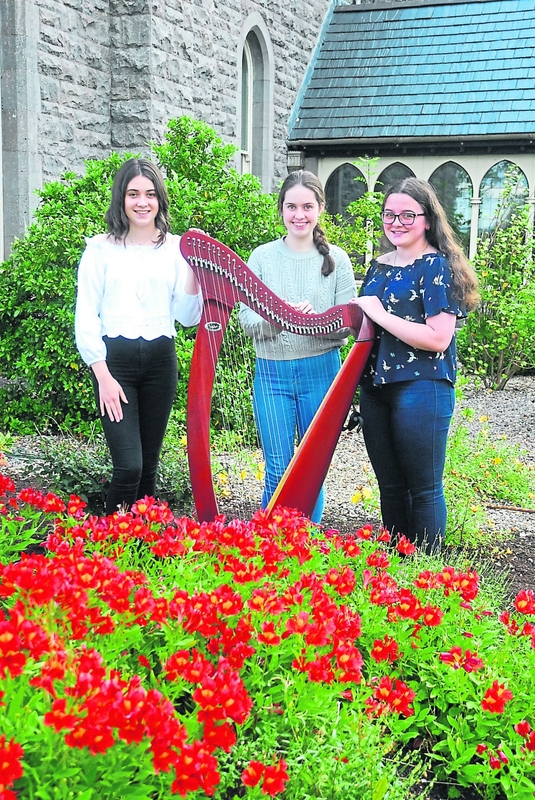 Yes – the big 40 – The O’Carolan Harp Festival, Keadue, Co Roscommon has commemorated the Harper and Composer Turlough O’Carolan every August since 1978 – with a break of one year in 2003 when the village was representing Ireland in the Entente Florale Europe competition. The final resting place of the last of the Irish Bards overlooks Lough Meelagh just outside the village. His influence through the repertoire he left behind is appreciated nationally and internationally. His music has been drawn upon in all kinds of musical genres – as diverse as National Anthems (The Star Spangled Banner), movie soundtracks and even latterly sampled. The annual event is now one of the leading Harp and Traditional Music Festivals in Ireland, especially promoting harp music and the music of O’Carolan. It attracts harpers from Ireland and overseas who attend the Harp School Classes and compete in the International Harp Competitions. Participants have an opportunity to participate in the many traditional music events and sessions throughout the Festival & Summer School. Overseas visitors especially enjoy the relaxed atmosphere in the scenic surrounds of unspoilt north Roscommon. But for those not taking part in classes, there is still much to do. For the landmark 40th year, organisers have attracted more concerts - with both the local Church and the imposing St. Ronan’s Hall in the centre of the village playing host to quality music and song. A new Concert on Saturday night for the 2018 programme features SHASKEEN on stage from 9.30pm in St. Ronan’s Hall. There is plenty of street entertainment throughout the weekend. Fresh from appearing on Fleadh TV on TG4 from the successful Connacht Fleadh in Ballinamore, we are being joined from the GigRig at St. Ronan's Hall with Tom Doherty, David Doocey & Pat Coyne at 4.30pm on Bank Holiday Sunday in an open-air event in front of St. Ronan’s Hall. They will have followed our official opening with a special effort for our 40th - where the parade will be led by the Raheen Pipe Band. The parade commences at 3.30pm. Music at the Heritage Park begins on Bank Holiday Monday at 3pm with the multi-award winning local CCE group - a number of whom are headed for the All-Ireland Fleadh in Drogheda later in August. The growing phenomenon that is the world famous Door Dancing competition will see all styles of Sean Nos compete for the title of 2018 Door Dancing Champion. The night whizzes by in a packed St. Ronan’s Hall as the young, the young at heart & the rest compete for the glory, the fun and the cheers on the door from yesteryear. Music is provided by Liam Purcell and his ever-growing group of friends. Compere will be long-time visitor and local TD Eugene Murphy. The O’Carolan Summer School features some of the very best tutors in traditional music instruments, set & sean-nos dance & traditional singing. Classes will be hosted throughout the village in Harp, Flute, Tin Whistle, Banjo, Button Accordion, Bodhran, Fiddle & Concertina. Singing classes move to the afternoon to facilitate those who would like to play & sing and our Set dancing takes place each morning, with Sean-Nos in the afternoons. The Set-Dancing classes are Department of Education approved for teachers. A Tutor’s Concert on Thursday 2nd will be another highlight in St. Ronan’s Hall with a Youth Recital earlier in the day at 2.30pm. Our harp recital in Kilronan Castle on Wednesday, 1st August will feature our own local, award winning and highly accomplished Keadue Harpers from 8.30pm. We are very proud of the heritage of harp playing that the Festival & Summer School has nurtured since it began in 1978 – and this concert will feature a large repertoire of local harp music composed by O’Carolan, latterly Michael Rooney from nearby Co Sligo (and long time visitor through both Junior & Senior competitions as he progressed through his immense musical career) by our local CCE members. We continue to have competitors travel the globe to compete in the Arigna Fuels sponsored O’Carolan International Harp competitions on Saturday, 4th August. They commence from 10.30am and we will be sure to be enthralled again with the very high standard of competition. Ceilidhs have always been part of O’Carolan Festivals and this year hosts two stalwarts of Ceili bands – the O’Carolan Country Ceili Band & Rise the Dust. Dancing will be brisk on Tuesday, July 31st and Friday, August 3rd – please bring along all your dancing friends for two great nights. We welcome the hugely popular Lee Matthews and his Band for a free open air concert on the street on Bank Holiday Monday afternoon. Lee featured on RTE TV in recent weeks and is making a big impression wherever he goes. So don’t miss it! This is just a flavour of what is happening – we haven’t mentioned the Crafts, Food & Arts Display scheduled for Bank Holiday Sunday. On Sunday night too, St. Ronan’s Hall plays host to living legends “Stockton’s Wing” in Concert from 9pm. Join Mike Hanrahan (vocals & guitar), Paul Roche (flute & tin whistle), Tommy Hayes (percussion, bodhran, spoons), Tara Breen (fiddle), Karol Lynch on (banjo & mandolin) and Paul McSherry (guitar) to relive a “mighty night” from their last visit two years ago. Tickets will sell fast and are available from the festival website or by ringing 087 2559269. See www.ocarolanharpfestival.ie or follow on Facebook. Brochures available from local tourist information offices, theatres, hotel & B&B lobbies, shops or any committee members.